I’ve been blessed. Seriously. Not everybody gets to love what they do as much as I do. I’ve taught private music lessons – piano, organ, voice and theory — since 1972. And there have been many years — and I do mean many years — I’ve served as a church musician. I’ve been the organist, the pianist, the choir director, the director of a graded choir program for kids, a handbell choir director (children, youth, adults and multi-generational), praise band leader, and lead musician or Director of Music for small churches, big churches and some middle-sized churches. I’m a Certified Church Musician (retired) with the Presbyterian Church (USA). I’ve worked in retail music stores, doing everything from running the sheet music department to earning sales awards and managing stores. For several years, I was the Director of Education for the one of the southwest’s leading organ and piano stores, a place which allowed me the privilege of introducing the joys of making music to literally hundreds of people. One of the most fun jobs I ever had was the fifteen years (1985-2000) I spent as a staff writer for Sheet Music Magazine. I wrote arrangements (mostly organ, some piano), had a reader write-in column, a regular feature column and made personal appearances. My articles and interviews have appeared in over a dozen other periodicals and journals as well, including Keyboard Companion, Hurdy Gurdy, The Organ Teacher (I was the editor for that one for a time), and several religious publications. There are few music instruction books and one song book floating around with my name on them, too. So, how in the world did all of this get started? It was, in large part, because my parents understood the value of music education. My mom never took lessons but always wanted to learn. When my dad was young, his mother took in extra laundry to pay for his violin lessons. 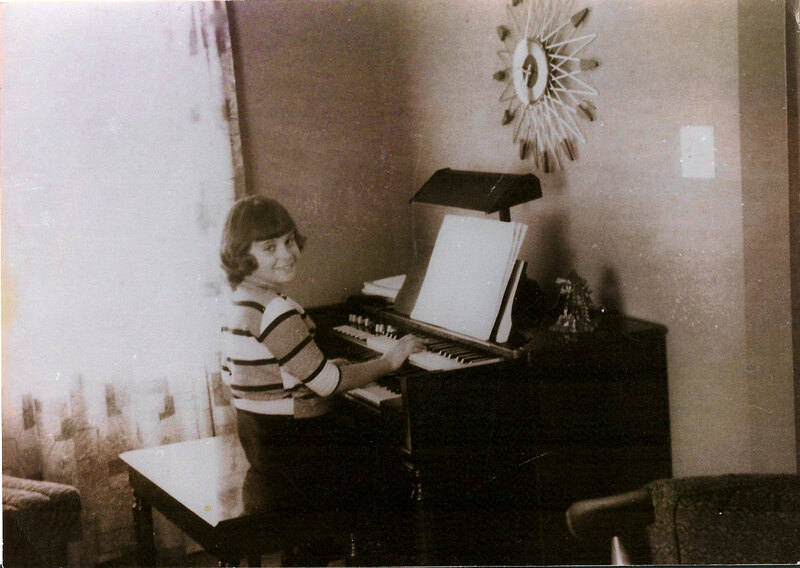 When I was 8, I went with my parents to our local music store, and they decided I would play the organ. My parents bought a little second-hand Hammond M-3 spinet organ and the journey began. My first teacher certainly did a great job in guiding me to develop a love of the instrument, but not such a good job in teaching me to play in the style that I wanted. This was ‘back in the day’ of the Pointer System (anyone remember that?) but I wanted to play for church and learn Bach. Yeah. I was *that* kid. The organ bench came with two wooden pegs which would prop the bench lid up…so I could reach the pedals easier. Note the horrible hand position, but the seriously awesome wall clock. So, after a couple of years, we switched teachers….and I had to absolutely start over again. It was very frustrating for a while, but in the long run has served me well. Now I am as comfortable reading a classical score as I am reading a jazz chart. In the odd way things sometimes happen in life, my junior high school (Lombard, for you Galesburg folks) had a Hammond M-3 in the auditorium, identical to the one I had at home. I don’t recall how it all came about, but in 7th grade I somehow got the job of playing the organ as students gathered for assemblies. As delighted as I was to perform, this job came with the highly coveted perks of getting out of class early AND a permanent hall pass. I was hooked. A career was born. I played at church and played at school. Three years later, I was amazed to find that my high school had an organ, too, so I kept playing for various church, school and civic events and soon began teaching. And so it has continued — I am still teaching and making music at home, at church and wherever my travels take me. My enthusiasm for music has never wavered. I continue to marvel at how sound waves which cannot be seen can come together in a way that is felt by the soul. The magical mystical connection between people making music together can only be understood by those who have experienced it. Music is a gift. And it has been given to each of us. a child , it brings calmness to our soul’s. Thank you, Valarie, for your very kind words. How wonderful that you had the opportunity to learn music in your youth. It is an amazing gift to be able to enjoy music for a lifetime! As a no-talent guy who can’t make music, I do enjoy hearing music made by talented people like Gail. At a recent event at Central Congregational in Galesburg I heard Gail play the organ. What a powerful, moving effect her music had on all who attended that event. What an wonderful story you have to share! Bless you lots in your new venture of blogging. Congratulations on making it through Blogging U 101! I could not figure out how to answer you on WP. But thanks for writing and I do think we have things in common. I did play piano when I was young and have always appreciated music. I’m in the PC(USA) too. Thanks for the follow and I look forward to getting to know you.